I’ve noticed in the several years I’ve been on twitter, and followed many writerly folk, that interactions have changed. Instead of us all sharing our experiences, new behaviors have taken shape. I don’t mind if you tell me you have a book. I’ve gotten some cool books from people I already liked on Twitter. What I mind is when you only try to sell me a book. Try to sell me a book. every. 5. seconds. When does slamming someone with advertising ever work? If someone asks you to do something over and over, and never says anything else, does that work on you? Me, either. Hop on to hash tags, like #amwriting, with their book or blog posts not about writing. Hash tags are not a secret meeting that if you could get into, everyone would notice your thing and ooh and ahh. Hash tags serve a purpose and providing you with a ready-made audience isn’t it. Retweet 17 random things in a row. By in a row,I mean your random retweets are all I see in a very fast moving feed. It means you’re just pointing-and-clicking, boom, boom, boom. And I know why. You’re hoping people will retweet your ‘on sale now’ tweet. Don’t give social media advice when you clearly don’t get how to do social media as an author. I once had to unfollow someone who wrote a book on how to be on social media and sell your book. They were guilty of all the above. I shudder to think what their book was about. All the research shows that being genuine and interacting with people on social media will go much further than harassing or ignoring them will.Check out Kristen Lamb’s web site and books for better info on how to use social media in your favor. By the way, notice I said use social media. Everything I mentioned up there just smacks of using people. So, I love sending people articles I find (which is why I’m going to be adding more of those here) but I’m picky about how they look. I don’t share from feedly because it creates a big word regurgitation that no one will want to read. I like pocket, because it provides previews and I can even share quotes. But, even I recognize how ridiculous it is to send something to pocket only to find it and share it later. Let’s ease back on the OCD, shall we? And so I discovered this. It’s beautiful, neat, and it encourages others to go to the original content (we writers appreciate that). 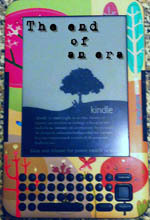 I included an image of what I received in the email, mainly because my Kindle is quite uncooperative. Try it out if you find your self sending a LOT of links, like I do. I think it’s probably an understatement to say I’ve flirted with depression and have an ongoing relationship with anxiety. I call it being “high-strung,” mostly because that sounds prettier than “I’m a wreck.” My boss and I joked today about how my insomnia is directly related to all the things I can stay up at night worrying about. It’s a fact. I’m always looking for ways to find my joy. That’s another one of those phrases I’ve coined. A person, every last one of us, should work to be happy. Research shows that people who keep gratitude journals were way more awesome, and successful, and etc. Enjoy a book–take a moment and recognize that. Puppies are cute? Take a moment, enjoy the puppy. Find those moments of joy, doesn’t matter what it is, and recognize those feelings. Bask in them. Share them, even. That’s where Happier comes in. It’s an app that you download and just share those small moments. The app offers to let you follow the moments of those you already know from Facebook (and other social media). And then, when you read the moments of other people, there’s this warmth that fills you up, and it’s… nice. Others can tap and let you know that your moment made them happier. One of mine got on their featured page, so I made lots of contacts with other people trying to be happier. Couldn’t you be a little happier? Go read some of the things people have submitted because, well, they chose the best of them. And they’re best is better than mine. But, please, try the app. Let me know what you think about it. I don’t know how to let you add me, but, hey: Lori Sizemore. Look me up. I described in my last post how full my life has recently become. I won’t complain– I’m thankful for it. Most of the time. And sometimes I do complain, but I try to limit it to those nearest my heart who know I occasionally need to vent. All the same, I need time to write. That has to come first. And so, this blog will be on hiatus until November 1, 2013. Let’s all hope I’ve acquired better time management skills by then. You can still find me @ Heart-Shaped Glasses every month, on the 7th, and on the web elsewhere (see the column on the right). Yes, let’s all take a moment of silence. Before I go on, let me explain why the loss of my Kindle has made me inconsolable. I’ve always been a book lover. Paper books. Mmm, is there anything like that smell? A little vanilla, a little ducking into the library to read because you don’t really fit anywhere. But, then, the idea started to grow on me. Never being without a book because I can slip this small, lightweight techno-gadget in my purse. I’m a techie kind of girl.My two favorite things had made a sweet little baby capable of holding a thousand books. A few subtle hints to my husband (reality: I pestered the hell out of him), and I got one for Christmas. Destitute from gift-giving, I filled it up with free books. FREE books. That I didn’t even have to leave my home to acquire. I read Pride and Prejudice for the first time. I read a bajillion more books. I found ways to read online articles and receive site feeds on my Kindle. I was suddenly reading at the doctor’s office, reading while I stirred food on the stove. Reading, reading, reading. Since then, two years, they’ve come out with several new models and, what I’ve been eyeing for the last few months, the Kindle Paperwhite. In fact, my Kindle (billed as the top-of-the-line Kindle 3) became downgraded to the Kindle Keyboard and isn’t even sold anymore. Point: it’s old and ready to be replaced. So, I’ll be happy to have my new Kindle. Reading in bed without lights on a screen that isn’t backlit! (I’m squeeing right now.) And yet, seeing my Kindle lying there, useless–I’m filled with sadness. We shared some pretty incredible times. I dressed it up, made it mine, filled it with magical stories that inspired me and helped me get through the hard times. It’s like my love of reading in physical form. Okay, but what about those old Kindles? Do you remember how on Toy Story 3, all the toys got donated (finally! Jeez kid, give up the toys already!) to a little girl who would love them just the way that kid in the movie did? Well, if you are a better Kindle caretaker than I obviously am and have an older model lying around, while you enjoy your new e-reader toy, then I have a suggestion for you. Donate it to the Kindle Classroom Project. I can think of no better purpose than giving the joy of reading to kids. Maybe, they’ll find a private corner somewhere and discover the place they fit, inside a story. P.S. If you also have broken your Kindle, be responsible and recycle. Those batteries don’t belong in your local landfill. Amazon will pay for you to ship it back. I imagine they’ll mine it for parts before doing whatever it is one does with batteries that can explode when mishandled. There seems to be about 20 posts missing. Old ones, but still some worth keeping. I can’t find them anywhere. They’re not in the database or under the couch cushions. I’m hopeful that I can extract them and upload them from a database backup. But… we’ll see. That may be beyond my ability. Anyway, if you happen upon a 404 error in a link, feel free to email me or leave a comment on the contact page. Thank you! Update 06.04.2012: I found my words. You’ll never believe where I left them. Within a few hours of my notification, the entire site had been suspended. Today, when I went back to the offending post, it’s gone. Is it sad, because that happens so rarely, I’m actually shocked? But, also thrilled. And, because I love you, I will compare the stolen, disfigured text to my own. A couple of weeks ago I wrote a post. I’m not going to tell you which one because… okay, let me tell the story first. So, a post. I publish it and it’s not even about anything (as usual). It’s not even one of my posts that people occasionally find useful (like the one on Kindlefeeder, or The Hero’s Journey in Clash of the Titans, or some of the writing posts). The day after I published it, I caught a weird pingback in my spam filter. I get those all the time when I link to one of my older posts but this one wasn’t from me. But, it was my words in the little sample that shows up. When I clicked it, I found a beauty site (beauty, people–how many times have I blogged about that, I ask you) that had copied my entire post whole without any attribution whatsoever. The links within the post still pointed to my site (hence the spam filter pingback). Worse, most of the site, other than my post, was in another language. I know that copyright laws aren’t enforced in many countries, so I knew a report to the host would probably not yield a result. So, I emailed the person. Nothing happened. Then, I left a moderated (and, so far, unapproved) comment on the site and told them that they’d copied my post in whole without any attribution, that I would make a complaint to Google which may or may not affect their search results. And some other things I couldn’t really back up. Because, seriously, what am I going to do about a post on a blog I don’t make any money from? Anyway, when I went back this week, because now it’s a car wreck and I can’t look away, they’d ran the post through one of those programs that changes the words but isn’t supposed to change the meaning. Except, now it sounds like I have a poor grasp of the English language and it links back to here through those links I mentioned earlier, so now I’m mad and a little embarrassed someone might think I wrote it. I’d link to it so you could all go have a laugh except I’m afraid if the traffic there goes up, they’ll steal everything I do. It’ll be like having a thought-stealing internet stalker. And I know how people are, because I’m the same way, and if I just give you a screencap (or tell you which post), you’ll google the words and find it and drive the traffic up that way. So, now, I can’t even call them out on it. Other than making legal threats I can’t really back up in their comment section, does anyone have any suggestions? Photo used with permission from stock.xchng. Photo by: Pedro Pasquale. Edit 05.13.2012: Turns out Godaddy is hosting the site, though it’s owned in Vietnam. Godaddy was not the host, but they walked me through tracing it back to the real hosts. I sent the DMCA Takedown Notice (on the advice of Penrefe in the comments below–thank you! ), so fingers crossed. Penrefe (@Penrefe, twitter) is gaining a reputation as an exceptionally helpful commenter, like in this post, when she explained to me what a “licker zombie” was. Edit 05.16.2012: I just realized why they stole this post. Because it has beauty in the title. Doh. Also, an update!